This week’s trading journals are likely to be brief as I have a ton of work to catch up on for school and more importantly, the markets are bound to be whipsawed back and forth due to political headlines and key US macro data being released late in the week. I personally will not be doing much in terms of trading, my only position is that of JCP mentioned in last week’s trading journal. Anyway, futures opened down 100 handles on the Dow as many had expected a resolution in congress but were mistaken once again by their incompetence. We did manage to move back toward the flat line during the day, with last week’s leaders going green first, only to end the day in the middle of the range. The VIX unsurprisingly continued to break out with a gap higher through resistance and closed up 7.5% on the day. Gold and Silver did not catch a bid, which was a bit of a surprise to me but not a totally crazy occurrence as the dollar clung to the flat line as it attempts to base at 7 month lows. Financials remain weak but found some trend line support just above a rising 100 day EMA. USO broke to the downside and failed a back test of support as it took back the 100 day EMA. Bonds were flat as 10yr yields continue to hold the 2.60% area. Continue to take cash flow type trades as we get some more direction out of the markets toward the end of the week. Between the Government’s shenanigans and the macro data I expect some more volatility so its probably best to let the dust settle before putting any real capital to work. SPY back above the 50 day but could see a test of the trend line below. New quarter begins tomorrow and this week could really set the tone for the rest of the year. Resistance above at falling short term EMAs and the gap. SPY continues lower toward the 8 week EMA as it builds a potential bearish rising wedge. RSI divergences continue as price looks like it wants to test the trend line below. IWM flagging above the 8 day EMA after a nice two week move through resistance. Rising short term EMAs below. Flag resistance above. 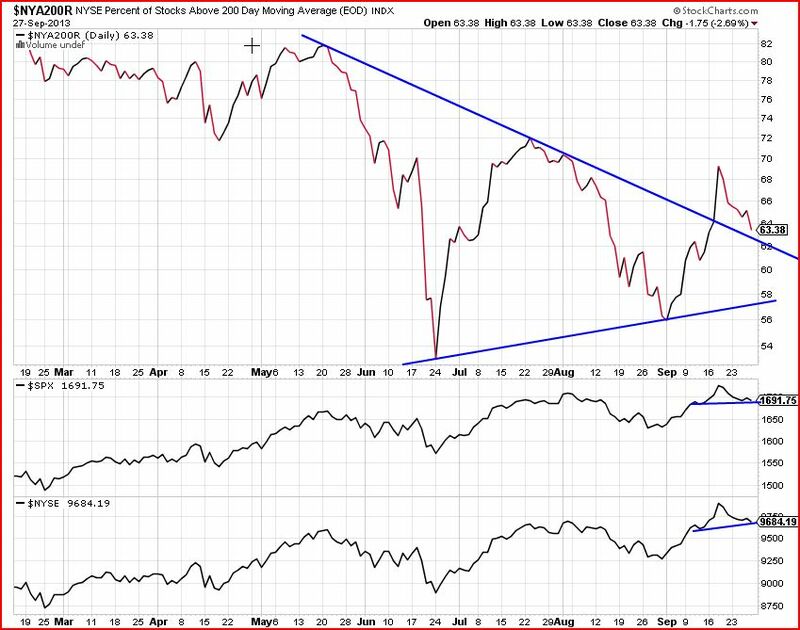 Remains the strongest of the broader indices. DIA building an upper level rising channel. Continues to be the underperformer as it barely holds the 8 and 13 week EMAs after a failed back test of the broken November trend line. Market breadth continued to deteriorate this week as the major indices drifted lower. 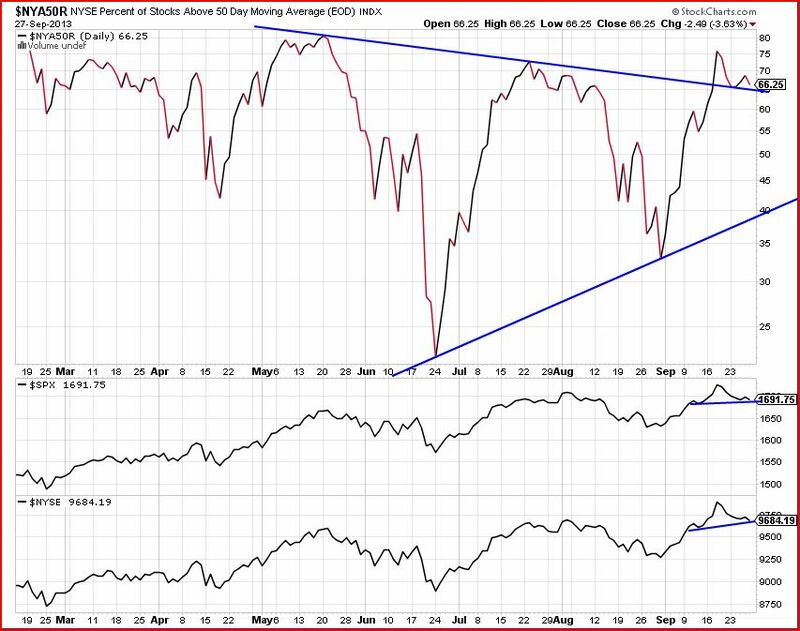 These divergences continue to be a major concern for the longer term health of the trend higher. Some indicators suggest that we could be due for some more volatility in the short term especially with the amount of US macro data hitting the tape this week. Most indicators are back-testing a prior breakout and we will see if it confirms a solid breakout or a false breakout. Markets continue to drift lower despite macro data that met expectations, although consumer confidence did come in a bit light. The end of the month/quarter window dressing continues to push strong stocks higher and weak stocks to continue getting dumped. Interest rates continue lower pulling the USD with it. As you might expect the precious metals were up on the day and oil continues to hold support. Big macro data next week including non farm payrolls but the market can’t tell good news from bad after Bernanke threw a curve ball by not tapering despite consensus expectations. More analysis to come over the weekend. Long 100 shares of JCP @8.99 and an October 11th 8.50/8 put spread @.20 debit both executed at the close. Still long 1 October 19th 11 strike call from .58. SPY rejected by a falling 21 day EMA as it looks to test the gap and possibly the 50 day EMA next week. Hourly chart shows a positive RSI divergence and possible falling wedge pattern. Horizontal trend line resistance and falling EMAs below.